Many of us see people celebrating their 100th birthdays on the news, and we wonder how they were able to reach that age and still look healthy and active. 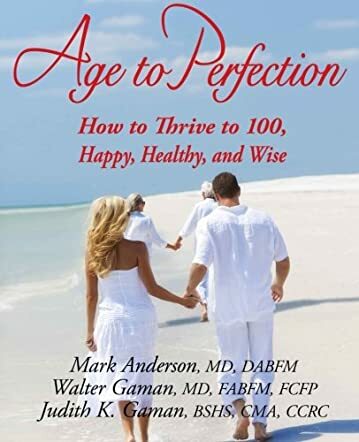 Age to Perfection: How to Thrive to 100, Happy, Healthy, and Wise by Walter N. Gaman, Judith K. Gaman, and Mark J. Anderson will tell you just how to do that. From eating right to exercising to having the right outlook on life, this book will fill readers in on the known and not-so-known secrets to living to 100. Readers will not only get advice from the doctors and health professionals who wrote this book, but they will also receive tips from living centenarians on how to live a long and happy life. When I received Age to Perfection, I sat down and told myself that I would read a chapter or two before bed. Before I knew it, it was past midnight and I had read over 100 pages. This book is filled with fascinating facts and tips that everyone should know about. I was constantly telling my husband and other family members about everything I was reading because I realized how significant this information can be, and I want us all to live long, happy, and healthy lives together. Gaman, Gaman, and Anderson do an excellent job of presenting this information in an organized and well-written way that people of all ages and backgrounds can understand and relate to. I may be in my 20s, but I am so happy that I got the chance to read this book because it not only gives me a great outlook on how to live my life, but it also gives me an idea of how to raise my daughter. I recommend this book to EVERYONE. It’s never too early or too late to turn things around and begin your journey to a better life.